One morning Beverly Ann walked through the door of Alfheimar Guesthouse in Borgarfjarðar eystri. She’s a travel storyteller from Canada. The plan was to fly on Air Iceland to Egilsstaðir, a small town located in East Iceland, and continue to Borgarfjarðar eystri. The plan was to write about elves. You see, Borgarfjarðar eystri is home to the Icelandic elf-queen, church of elves and a whole host of hidden people. But like anything imaginary (although are elves imaginary or are they real? ), one has to rid logic and release the inner child. One has to feel inside a vibe of make-believe and be open to fairytales. I can usually do this but right now I am just not feeling it. I am just not sensing the elves. I chuck the plan. So then, what am I going to write about? Driving along Route 94 from Egilsstaðir to Borgarfjarðar eystri begins as a rather sleepy drive. Clumps of moss hug together by the road, a road that is part paved, part gravel…a road with a visual of flat land that seems to go on forever. But when the sea becomes visible in the horizon, the landscape is strikingly beautiful. Jumbo puddles of water are glassy smooth and blue coloured. To my left Héraðsflói Bay is hugged by mountains that end in the sea. There is an open-air breeze and straight arrow of blue: sky and sea come together. And then. Well let’s just say: Stay focused. Otherwise you may end up in the drop zone. Vertical up, hairpin curves, horizontal traverses, vertical down. Up, over and down the mountains she goes. But what is on the other side will take your breath away. And I am not the only one who thinks so. Mirjam Wouters, who was born in The Netherlands, is thirty-four years old. I meet her at Álfheimar, a guesthouse owned by Arngrímur Viðar Ásgeirsson. The plan was to meet Arngrímur but he had to travel to Akureyri so I chuck that plan as well and spend an afternoon with Mirjam, his first guest of the season. Mirjam is instantly likeable. She is pretty, friendly and jovial. She has a really unique story to tell so the elf feature is definitely shelved. Like any child filled with imagination and oftentimes the ability to just ‘know’, at three years old, Mirjam told her mother she was going to explore the world. She then went outside (her mother assumed she was off to play in the neighbourhood) and walked five kilometres to a pond. Growing up in the Netherlands where biking is part of the culture, Mirjam spent her family holidays biking and camping around Holland, Belgium and Germany. Biking felt natural to her. So it was not surprising that Mirjam set out to explore the world. And it is not surprising that being on a bike felt natural to her. But what is surprising is that she has (thus far) travelled 70,000 kilometres exploring the world by bicycle. At twenty-one years old, she backpacked Ireland. For the next six years, she alternated between working at a youth hostel in Derry and travelling, picking up temporary jobs along the way. During this time, she decided to bike to Spain and learn Spanish. She fell in love with the freedom of travelling on a bicycle. A detour, as a result of her bike being stolen, took her from Seville to Santiago de Compostela by foot. Walking part way on the pilgrimaged Camino Trail, she walked approximately 1,200 kilometres. But walking hurt her back, knees and feet. It was much easier to travel by bicycle. For the next few years she biked through Eastern Europe, back to Holland and up to North Cape, Norway, located at 71°10’21”. Her biking routes are too many to list however her biggest and grandest achievement has to be: At the age of twenty-seven, she set out on an epic journey. By bicycle, she travelled from Holland to Australia via Europe, Eastern Europe, the ‘Stans’ (i.e. Turkmenistan, Uzbekistan), China, Tibet, Nepal, India, Thailand, Laos, Malaysia, Singapore, Bali and Sumatra. Flying to Darwin, she biked through Australia and New Zealand. Upon return, she continued biking through Japan and South Korea before flying back to Holland. Although she flew home a few times, this journey took her six years. She alternated between travelling around by bicycle and working. She is financially self-sufficient and finds it rude when people ask her where she gets her money. She just doesn’t spend (or need) a lot of money. Her first love is travel and the people she meets along the way She is quick to point out that she is not a cyclist. Rather, she is a traveller who uses a bicycle as transportation. She does not set goals for a certain amount of kilometres per day nor does she set a travel plan. Instead, she allows the travel to unfold as it is supposed to, organically, authentically. She leaves it to chance. “If you plan, something always turns out another way,” she tells me. Mirjam is a rarity and that is one of the things that makes her so special. She is not afraid to be true to herself and is not dictated by what others think she should do. She has at times been made to feel stupid, told that she should be more useful (get a real job), that she is on one constant holiday, and to make her question herself: Is she a bit selfish? I suggest that those who make these comments are jealous. They are, to some extent, a product of society’s expectations and afraid to venture out of the conventional wherewithal box. Mirjam is not processed by what is expected by others. She does not feel guilty for travelling the world. She makes no apology, nor should she. She is guided by her heart and soul and not by the conventional noises in ones head. No, she is not on holiday. Instead she is brilliantly experiencing life few dare to. No, she is not stupid. In fact she is a very smart woman. (She has encountered very few situations where she felt uncomfortable – which takes smarts.) And yes, she contributes to society, perhaps in more ways than the average person. She is an inspiration. She is a breath of fresh air. She believes in herself and in her instinct, and she is true to her spirited being. She simply lives the life that feels real to her. I suspect she has no idea how many people around the world she has met who have been touched, or changed, by meeting her. Mirjam arrived in Iceland on February 6th. 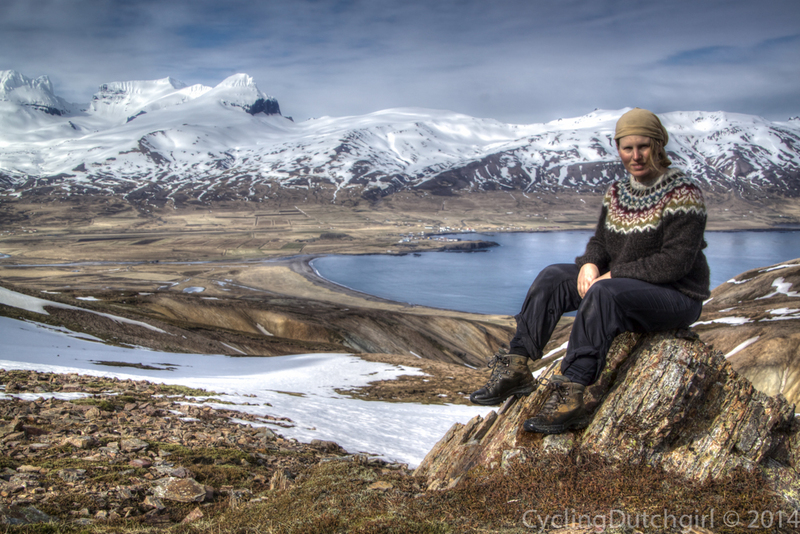 She bicycled the south of Iceland with a friend before making her own way up the east coast to Egilsstaðir. From there she biked towards Borgarfjörður eystri. One morning, leaving her tent where she pitched it the night before (she is nomadic by nature, preferring to sleep in a tent), she set out up and over the mountain to see what lay beyond. Two and a half hours later, she came upon Borgarfjörður eystri. At first glance, she felt like her heart was going to burst. She instantly fell in love with the village and scenery. Borgarfjörður eystri is a small fishing village with a population of about one hundred and thirty people. It is a gorgeous nook of a place by the sea. The smell of the ocean permeates blissfully about. One can’t help but feel it is a beautiful little secret off the tourist-tramping map. The village and surrounding area is primarily known for its outstanding hiking trails, elves and a large puffin colony. But what really makes Borgarfjörður eystri special is: There is something in the air here, something that is difficult to describe. If Mirjam is to stay in one place for a while, she needs to work. She went to Álfheimar and asked Arngrímur for a job. She will now spend the next few months working at the guesthouse and helping at a near-by farm. “There is an energy here – something special. It’s a place that you feel in addition to the fact it is beautiful. The people are really nice here,” Mirjam tells me. Although she planned to begin a bicycling trip through Canada, United States and on to South America, for now those plans have been chucked. Maybe she will go end of summer…maybe not. For now though, Mirjam, her bike and about forty kilos of her belongings (everything she owns other than a pair of roller blades at her parents house) will stay in Borgarfjörður eystri. She is a brave girl. No question. But what makes her exceptionally brave is that she dares to live her life on her own terms. She dares to allow everything to happen by chance and she dares to travel into the unknown. June 21, 2014 in Europe, Iceland. About Dams, Lambs, Rams and … Summer? ← About Dams, Lambs, Rams and … Summer? very nice Mirjam…. I laughed about the Roller Blades 😉 good on you girl !!! That’s answered all the questions I meant to ask you when you made me coffee and I shared your chocolate biscuits ( nicer than my fig rolls ) the other day on the road in West fjord . Thanks again , you are an inspiration to travellers and non travellers alike ! Wat een geweldig stuk! Ze weet je echt goed te omschrijven en het is zeer herkenbaar 🙂 . Good post, but I missed the usual stunning photos! Mooi geschreven en voor zover ik je ken, treffend. Ik kan alleen maar respect hebben voor je keuzes. Ik hoop dat ik nog een tijdje met je mee mag reizen. En als je weer in Nederland bent, je bent hier altijd welkom in het noorden. Beverly has depicted you very well. Take care lady. SO Brave and definitely an inspiration! I discovered Mirjam’s blog through a cycling friend of mine. Me and my partner Chris are going on short cycle journeys since some 10 years, every summer. We love the feeling, but are not that adventourous as Mirjam is. Never the less: she is a big inspiration for me. The little video where she is preparing “mached potatoes”…I just love it !!! Wow!!! You blog is amazing, your pictures are stunning and you adventures are inspiring! you frigging go girl!!!! This article seems to just only give a hint of who you are and it already touched me.!!! I hope you never find anything better to do and keep on travelling!!! I love to read and watch all about your adventures Mirjam; you are a true hero! Just a comment on the detail of the journalism above: You do have a job – you’re an entertainer. You are akin to a traveling minstrel from times past, bringing news and stories to all the people you meet and read your blog. And you do it very well!